The ramifications of an adverse biological occurrence are higher in the pharmaceutical industry than in any other. Cross contamination has unintended consequences of product recalls, regulatory non-compliance, ruined brand reputation and, in extreme cases, even death. To keep pace with an aging population, an increase in chronic and infectious diseases, and the ever-growing need to comply with various government regulations, the pharmaceutical industry is investing more heavily in processing equipment.1 For many companies, purchasing used manufacturing equipment presents an excellent opportunity to implement necessary technology in a more cost-effective manner and with shorter lead times (it can sometimes take upwards of a year to manufacture new equipment). Customers purchasing used equipment need complete assurance that the machinery presents no risk of cross contamination. Conducting microbial testing and biological decontamination of used equipment — before it is placed into service — offers peace of mind to customers who are worried about bringing an outside system into existing aseptic or controlled manufacturing conditions. 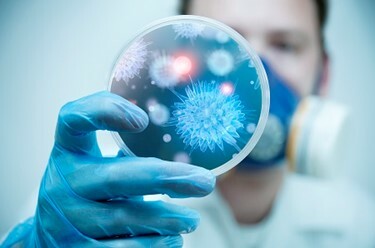 Microbial testing and equipment decontamination can be offered as a value-added service by an NIH-credentialed bio-decontamination company, providing value by saving manufacturers time and money. While some drug makers may have a decontamination program, the process of decontamination usually occurs in a dedicated area. It is often not practical to bring a used piece of machinery into that area, as it poses the risk of contamination. The decontamination company will perform microbial testing and biological decontamination prior to shipping the used equipment — along with all of the supporting validation documentation. While a company should have Good Manufacturing Practices (GMPs) unique to itself and/or dictated by FDA regulations or USP guidelines, manufacturers of biopharmaceutical and pharmaceutical finished products must demonstrate that harmful residues or organisms are properly removed to predetermined safety levels.2 A three-step decontamination process will ensure that used equipment is free from beta-lactam antibiotics as well as destroy up to 99.9999% of harmful pathogens and contaminates. In pharmaceutical manufacturing, β-lactam and non- β-lactam production must be segregated due to the concern that a portion of the population is sensitive to broad-spectrum antibiotics like Penicillin G and Ampicillin, with serious health consequences if cross contamination occurs. It is important to note that a used equipment seller should not even accept pharmaceutical equipment into its facility without validation of what it had previously been used to manufacture. Any equipment that was used for β-lactam production should not be bought and resold unless the buyer is aware of the prior use and intends to use the equipment to manufacture the same product. β-lactam testing provides additional assurance to customers with heightened concerns of the machinery’s prior use. Swab equipment in several hard-to-reach areas. Analyze swabs using mass spectrometry equipment. Develop a report confirming the absence of Penicillin G and Ampicillin-lactam. Bioburden standards are established in USP Chapter <1072> “Disinfectants and Antiseptics.” There are several options that provide bioburden reduction ranging from Log3 (99.9%) to Log6 (99.9999%). Two of the most popular methods are standard and advanced. Standard Treatment: Appropriate for most situations, this involves performing dry vapor fogging with pharmaceutical-grade equipment and EPA-registered peracetic acid/hydrogen peroxide cold sterilant. Advanced Treatment: This can be used for challenging or high-risk applications, or for equipment with complex geometries. The process achieves sterilization results using chlorine dioxide gas with an EPA-registered chemical sterilant and treatment protocol. Gas is used because vapor may not be as effective for reaching all of the hard-to-reach areas. The bio-decontamination company will assist the client in determining which process is most appropriate. The goal is to select the least expensive option that will achieve the desired consequence. Upon completion of the equipment decontamination process, and after receipt of the β-lactam lab analysis, an extensive report validating the mechanical, chemical and biological performance is issued to the pharmaceutical manufacturer. The validation should be placed in a file in the event of an internal or FDA audit.3 The report is consistent with GMP compliance standards and follows the guidelines mandated by the associated decontamination equipment manufacturer. Biological Performance Validation: Biological indicators inoculated with Log6Geobacillus stearothermophilus bacterial spores (ATCC 12980) are used to validate the efficacy of the decontamination treatment. The biological indicators contain some of the most difficult to kill microorganisms and far exceed USP pharmaceutical requirements. While decontamination can be performed in less than one day, biological validation requires that samples be incubated for up to seven days. Mechanical Process Validation: All process steps are documented, including the proper chemical diffusion within the entire decontamination zone. Chemical Process Validation: Specific chemical strength levels and airborne vapor levels as measured in parts per million are monitored and documented. Beta-lactam Validation: Mass spectrometry analysis is conducted by an internationally renowned expert on beta-lactam contamination, identification and remediation. In addition to decontaminating used equipment prior to shipping, a decontamination company can go to a customer’s site to decontaminate equipment or complete facilities. This alleviates the customers’ burden or expense of having to purchase decontamination equipment, maintain it and train people to use it. Instead, they can subcontract the process, saving both time and money. Decontamination services can be scheduled on a pre-determined or emergency basis. The frequency becomes more pronounced in the case of a Contract Development and Manufacturing Organization (CDMO) that works for multiple clients and makes multiple changes in what it produces. CDMOs have to ensure the item produced prior doesn’t cross contaminate the next batch, which may be a different product altogether. In these cases, decontamination between batches of different products is essential. World-class equipment and facility bio-decontamination services are a value-added service offered by a used equipment reseller like Federal Equipment Company. Pharmaceutical manufacturers with potential cross contamination concerns can have them addressed by a certified bio-decontamination company and receive validated compliance reports. Pharmaceutical manufacturers can save time and money by having a contractor decontaminate their used equipment purchase before it enters their facility. “Pharmaceutical Processing & Packaging Equipment Market: Global Opportunity Analysis and Industry Forecasts to 2022,” Meticulous Market Research Pvt. Ltd., July 2017. Web. Asheesh Singh. et al., “Guideline For Establishing the Maximum Allowable Effectiveness and Sufficient Contact Time Period for Used as Disinfectant and Sanitization Solution,” Int. J. Pharm. Sci. Rev. Res., 45(2), July -August 2017; Web. Matt Hicks, Chief Operating Officer at Federal Equipment Company, is a pharmaceutical industry veteran with more than 15 years of experience helping companies get the most value and utility out of their manufacturing and process equipment assets.